This is the spot on The Escapist that you'd usually be reading recaps of Agents of S.H.I.E.L.D. Unfortunately, that series is now on Summer hiatus as it prepares to launch its second season in a few months. You might think that'd mean this space would be empty for a while -- or, rather, you might have thought that back before I spent a month and a half recapping the season, speculating on the next and then speculating on freshly-announced sister-series Agent Carter. As it turns out, getting me to forego a weekly paycheck is almost as hard as getting Agents of S.H.I.E.L.D. to definitively end a running subplot. Fortunately for me, Marvel Comics spawned many, many other television projects prior to Agents of S.H.I.E.L.D., and many of them made important contributions to the pop-cultural landscape that ultimately laid the groundwork for not only Agents but the entire Marvel Cinematic Universe. And since my swank 2007 Nissan Versa isn't gonna pay for its own gas, I'll be spending the Summer bringing you my fresh revisitations of these classic (and not-so-classic) television moments. By the time I was old enough to know who The Incredible Hulk was (three years-old, I believe, via the 1980s cartoon series)m the live-action television series whereby most of the non-comic reading world had heard of him had left the air. By the time I was old enough to know that it had existed in the first place, my fellow comics-reading peers had relegated it to the same ash-heap of adaptations we'd send Adam West's Batman to a few years down the road. Sure, the normals had (apparently) enjoyed watching a bodybuilder in green makeup throw paper mache rocks around with nary another monster, alien, cyborg or Thing to give him a real challenge (and no other Marvel heroes to bicker with, period); but we knew him as a gargantuan bruiser who tore whole splash-pages to bits and split mountains with a clap of his hands. Our Hulk -- the "real" Hulk -- was (by the time I was a regular comics reader in 1987) the most talked-about Marvel book on the shelves thanks to an epic, character-redefining run on the title by Peter David. TV's Hulk was a re-skin (if that term had existed then) of The Fugitive with Lou Ferrigno showing up once or twice an episode to break up sets in slow-motion -- hell, Bruce Banner didn't even have the right name! And so we (and just to be clear: By "we" I mean tail-end Generation-Xers born after '79 or so) by and large turned up our noses at "that" Hulk and waited for Hollywood etc to figure out how to pull off a "proper" one. It wasn't until years later, when the Sci-Fi Channel (they used to spell it right, believe it or not) began re-airing it in reruns, that I gave "70s Hulk" a chance and came to recognize what my parents (and older peers) had seen in it. 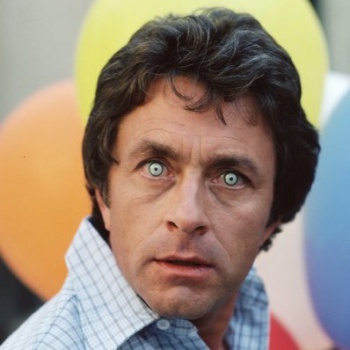 The Incredible Hulk is not a particularly "faithful" adaptation and, if we're being honest, it probably didn't use even its own scifi premise to the fullest potential -- but it was a good show, and its effect on the history of comics and their adaptations can't be overestimated. For those not immediately familiar: In this version, Doctor David Banner (apparently a TV producer ordered the change because "Bruce is a gay name") is a physician conducting experimental research aimed at figuring out the "secret" by which some people have been observed demonstrating superhuman strength in order to aid loved ones in distress -- and why he couldn't to prevent his wife from dying in a car wreck. Theorizing that it has something to do with "gamma radiation," Banner experiments on himself, unwittingly altering his physiology in a manner that causes him to transform into a musclebound, animal-like brute with its own separate personality (and child-level intellect) in moments of extreme emotional or physical stress. A second lab accident leaves the creature the media dubs "The Incredible Hulk" blamed for the murder of a colleague and Banner himself, so he begins to travel the countryside seeking a way to control or cure his condition... pursued by a determined news reporter who wants to know who (or what) The Hulk actually is.